Reaching out to grasp the eternal. Music from the past century merges with century-old traditions in expressions of religious faith in “Sacred Conversation,” a Symphony Joslyn concert. The content ranges from 1800 to 1978 in works by composers famed around the world, Franz Joseph Haydn, Igor Stravinsky, Japan’s Tōru Takemitsu and the U.S.A’s John Adams. Together they offer a cross-cultural experience connecting the homage and emotion in human lives moved by spiritual ones. Haydn and Stravinsky have never been much known for these kinds of works, but both wrote them. These performances focus on what they created in their sixties. Latin texts. Christian liturgy. Prayer. A Mass. A Te Deum. Stravinsky wanted his Mass to be “cold music” meaning bare rather than chilling. A way, he said, to “appeal directly to the spirit” by suggesting elemental ecclesiastical chants. Nonetheless expect warm, flowing moments amid much counterpoint. Clearly, though, in his Te Deum, Haydn sought to create a hymn of praise doing so with “bright harmonies” according to program annotator Paul Schiavo, also calling attention to moments of poignant supplication. John Adams was around that same age when he broke new ground, gaining admiration which has been growing even since, with Shaker Loops from 1978. Being known first as a minimalist, Adams was reaching beyond those confines into something more personal, more specific. As you may know, the Shakers were a fundamentalist American Christian group famed for communal dancing, moved by their belief in a heavenly power within them and above them. Adams defined their rites as “ecstatic frenzy that culminated in an epiphany of physical and spiritual transcendence.” As for the “loops,” the idea spins off from electronic manipulations of sound, incremental interlocking, as if increasingly laying on hands to unite the believers in a full circle. 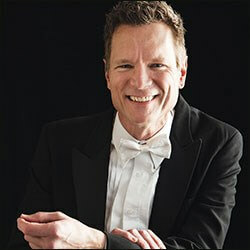 The Omaha choral group Résonance unites with members of the Omaha Symphony. Ernest Richardson conducts. One needn’t be in a cathedral or even believe in a specific religion to grasp the beauty and drama of what such music does. Witness for yourself.